So, today's post is something a little bit different for me because I don't normally post about hair (but no worries, I did a makeup look too!). Over the past week I had some extra free time, so I put together a quick video tutorial on one of the latest crazes to hit the beauty world: Hair Chalking. If you're not familiar with the technique, it's a simple, cheap and temporary way to dye your hair an assortment of crazy colors without committing to permanent dyes. Originally inspired by Lauren Conrad's to die for dip-dye do, bloggers and beauty enthusiasts everywhere have been desperately trying to recreate her colorful coif. One of the preferred methods for recreating this look without the permanence of dye is by using artists pastels, which I tried out for myself and filmed for your viewing pleasure. Please excuse my painful awkwardness and general hot messness. Filmed the first 6 minutes before I realized I had hot pink lipstick on my chompers. o_O Embarassing. I hope you can still enjoy and learn! I didn't use water because I have to go back to school this week as a teacher, so I couldn't have crazy cotton candy hair - so this faded from bright neon to soft pastel in about an hour. After that the color stayed put for over 24 hours before I washed it out with shampoo. The pink stained my hair a TINY bit, but nothing too noticeable. All in all it was fun to feel like a Unicorn for the day! My colorful hair also inspired me to try out a tutorial from one of my favorite artist's; Cora of Vintage or Tacky. I've been dying to try her Raspberries & Lime look for myself for the longest time now, so I figured why not? 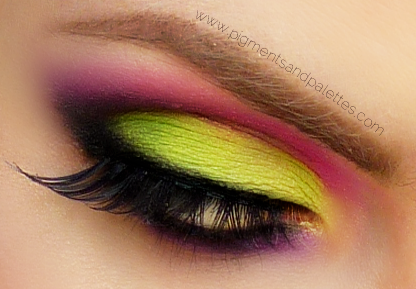 I already look like I stumbled into an episode of My Little Pony, what's a little lime green EOTD gonna do? 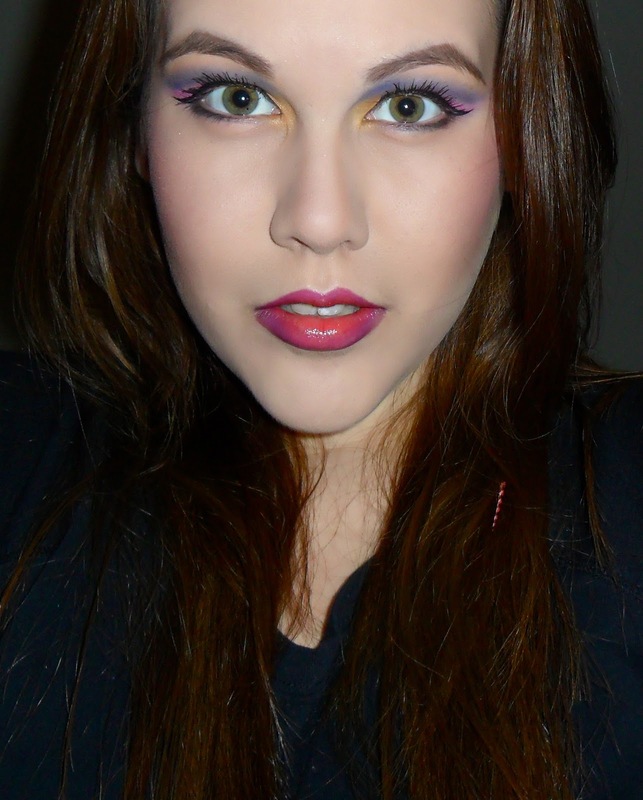 The hair and the eyes aren't meant to match, I just wanted to go totally color crazy that day. 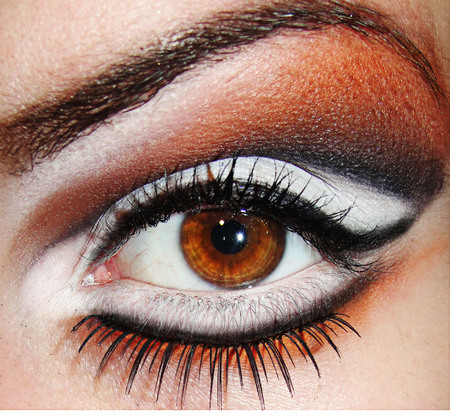 Here's a close up of my take on Cora's look. This look is a lot 'draggier' on me than it does on her, but I think that's partially because a) I have much bigger and more prominent lids and b) I can be a bit heavy handed when it comes to hot pinks and neon colors. I just can't help myself. 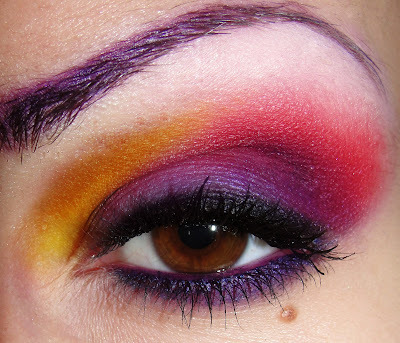 Anyways, I hope you guys found something in this post to inspire you to play with color! Send me your hair chalking pictures if you decide to try this out for yourself. PLEASE DON'T FORGET TO VOTE ON MY POLL (RIGHT SIDEBAR). 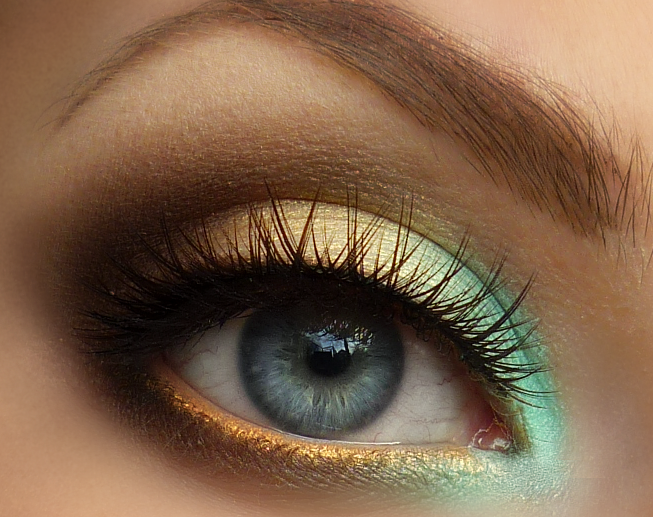 I want to improve Pigments & Palettes for you so I love to hear your feedback and truely value your opinion! Well, actually. Let's not be TOO modest. Probably more along the lines of this, am I right? OH WHO AM I KIDDING?! IT'S LIKE THE BEST WEEK EVER, RIGHT!?!!!! I had a lot of questions about what eyeliner it was and where they could buy it. Well, the secret is officially out. It's not actually eyeliner. 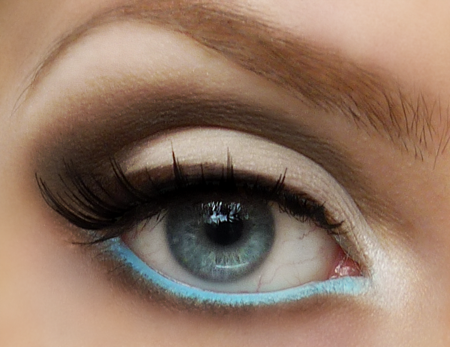 I used a combination of eyeshadow products to create the illusion of baby blue eyeliner and now you can too! In fact, you can make your waterline any color you want - this video will show you my nifty trick, complete with suggestions on how to best compliment your eye color. I apologize for the crappy lighting. Parts of the video are really over exposed so the colors are washed out a lot but there's not much I can do about it now without compromising the quality of the video. Nevertheless, I hope you find the video helpful and/or useful. I hope to be doing a few new looks soon, and I'll be posting a tutorial on dying your hair temporarily with chalk so be sure to subscribe to my YouTube channel and check back often for updates! Have an awesome weekend! First of all, let me say thank you so much to all of you who sent me such sweet messages about my Cockateal eyes look. It's one I'm really quite proud of so to see that kind of reception for it was truly amazing. I finally had an hour to myself this past weekend to do some filming so I created a short eyes-only video tutorial - now available in full HD. I'm still working on getting better lighting for my videos but it can be hard in a basement apartment with no natural light. Anyways, please enjoy and let me know if you have any questions. I plan on filming my Driftwood tutorial next, so subscribe to my channel and keep an eye out for that look later this week! 1. I am so dryly sarcastic—both in writing and in person—that I sometimes come across as hateful and I’m NOT! I’m easily one of the most whole hearted, genuine people that you will meet; I just joke a bunch! 3. I am extremely anti-discrimination. I am the first person you will see jump to defend someone being bullied. I will not tolerate it in any aspect of my life and I will always do my best to protect those I see preyed on. Whether they be my best friend, worst enemy, an acquaintance, or nemesis; I will stand up for and defend them in any form I can. 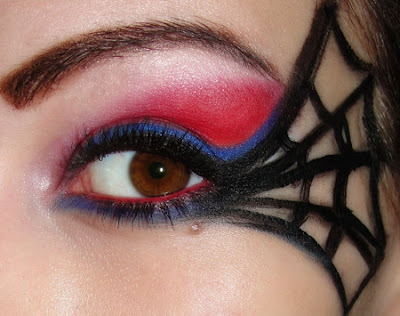 If you could design a makeup look for anyone, who would it be and why? If I could design a makeup look for anyone, it would be the music artist Pink. She has such a gorgeous bone structure and flawless features. I feel like our styles mesh a little bit and I could really create something that she would love. Not to mention, I would LOVE to meet her! I would say that my greatest personal success would be raising a happy, healthy, beautiful and polite baby girl while still staying in college and working. :] It makes me thrilled to know that I am successfully completing all three of those tasks at the same time while still being able to see her all the time. Oh, gosh. 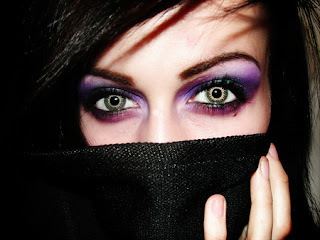 My first look I ever posted was most likely one of my green smokey eyes. It was.. less than perfect! Haha. Not to mention, my crazy eyebrows and horrible camera quality. If you never became interested in makeup, what hobby would have replaced it? I’ve learned that I am capable of more than I ever dreamed of and that the life I once wished I had is nothing compared to how amazing my life has become. There’s no way that I can only pick one favorite blog. 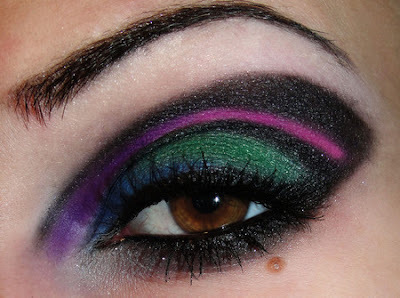 I love Pigments and Palettes(of course! 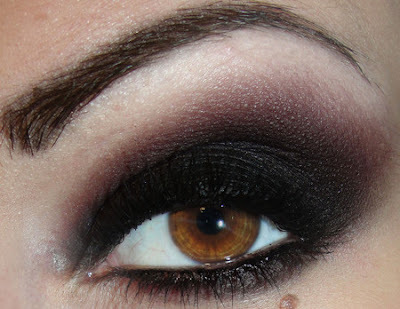 ), Bows N’ Curtseys, RoseShock, Xsparkage and Monroe Misfits Makeup. TWO: What is your favorite kind of inspiration? My favorite inspiration is the kind that is both artistic an emotional. Yikes. I would have to say my foundation! Acne coverage! FOUR: Favorite look that you've ever done? I’m not sure. Either my “A Clockwork Orange” or “So sloppy, so neat” look. FIVE: Favorite song to dance to when nobody's watching? Oh, man. It’s a tie between “In Too Deep” by Sum41 and “You Make My Dreams Come True” by Hall & Oates. 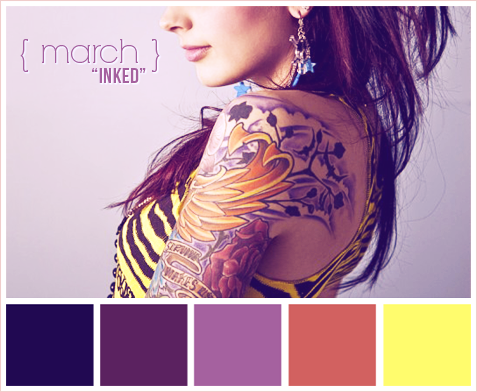 And finally, here's the Monthly Pigments & Palettes Challenge - "Inked", a look created exclusively for Pigments & Palettes, inspired by the following picture and color scheme below.